A SKILLFULLY BLENDED NON-ALCOHOLIC SPARKLING BEVERAGE OF ANGOSTURA AROMATIC BITTERS & NATURAL LEMON & LIME FLAVORS. 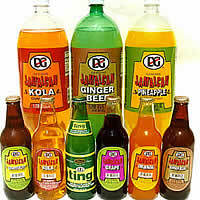 Multiple flavours of the refreshing, one of a kind taste Jamaican Soft drink. With our many flavours we ensure that no taste bud goes unsatisfied.